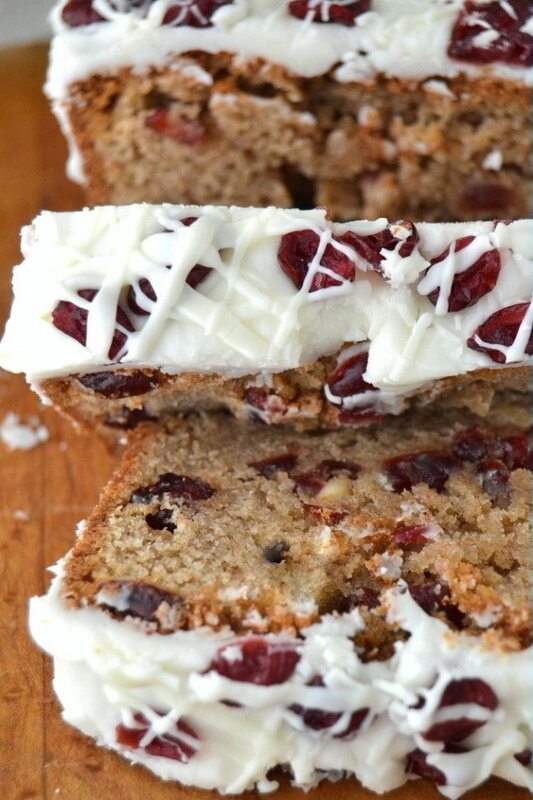 Better Than Starbucks Cranberry Bliss Bread has all the bells and whistles of the original bars in an irresistible pound cake form. Whisk together the flours, soda, powder, and salt. Set aside. Cream the butter and sugar until light and fluffy. Beat in the eggs, one at a time, and then the vanilla. Gently mix in the dry ingredients alternately with the buttermilk, beginning and ending with the dry ingredients. Fold in the cranberries and chocolate chips. Turn the batter into a greased standard (81/2 x 4 1/2) loaf pan. I like to line it with a sheet of parchment paper to make it easy to remove the cake after baking. Bake for 55 minutes to an hour until a toothpick inserted in the center comes out without wet batter clinging to it. Don't over bake, check it early. Let the cake cool before you frost it. To make the frosting mix the sugar with enough milk or cream to create a thick spreadable consistency.. Blend in the vanilla. Spread over the top of the cooled cake. Scatter with dried cranberries. Make the chocolate drizzle by melting the chocolate and the oil in a small (clean and dry!) microwave safe bowl. Microwave for 30 seconds and stir to melt. If necessary microwave for another few seconds, but be careful not to over do it. When the chocolate is smooth, take a spoon and drizzle it all over the top of the cake in a criss-cross pattern.